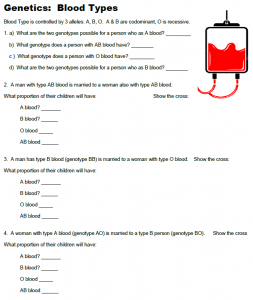 This worksheet provides students with practice problems on multiple allele traits, specifically on how blood types are inherited. The problems focus on the ABO blood groups and students are asked to perform crosses where parents’ blood types are known. For example, if one parent has type O blood and the other parent has type AB blood, what blood types are possible among their children and in what proportion. RH factor is not included in this worksheet as it is designed for beginning biology students and that is outside the scope of their lesson. Though, I do talk about RH factor, and how it follows dominant-recessive patterns. Good Morning – I’m using the blood typing worksheets to help my son better understand the process. Unfortunately the link for the answer key link is not working. It would be very helpful to us parents if we could have access to these. Thanks! By request from many teachers, answer keys were removed because students were using them as a shortcut. Many of these worksheets are just for practice, but I can understand making it too easy for kids and some will just take the short cut rather than try to learn. I can send answer keys by email. To what Email could we request the answer keys? If you include a school email here, I’ll send it, I just need to verify that you are not a student. I don’t have one handy for this worksheet, but I’ll put it on my to-do list! It’s on my to-do list! [email protected] Answer key please. I have other keys for free, but have been removing them by request because students have been using them to shortcut homework.